Frankfurt/Sant’Agata Bolognese – On the occasion of the worldwide preview of the Lamborghini Gallardo LP 570-4 Super Trofeo Stradale at the 2011 Frankfurt Auto Show, President and CEO of Automobili Lamborghini, Stephan Winkelmann, announced that the Lamborghini Sesto Elemento will go into production. 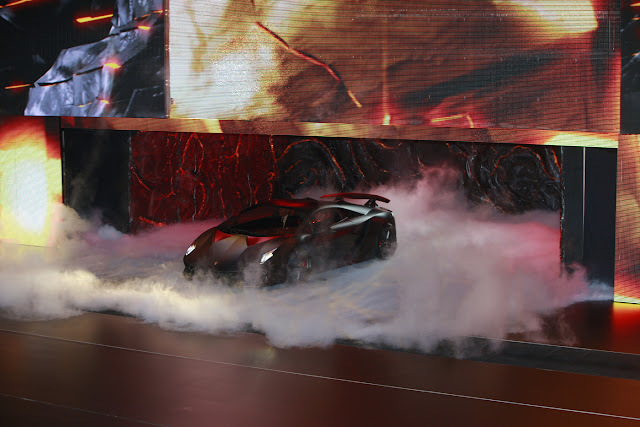 With the Sesto Elemento, Lamborghini’s Research & Development engineers have fine-tuned a cutting-edge package. Beginning with its pure, radical design, Sesto Elemento is the perfect blend between an extremely light weight 999 kg body; a drive train taken directly from motorsport; a power output of 570 hp; a highly responsive V10 engine and superior handling stability guaranteed by Lamborghini’s four wheel drive system. An exceptional power-to-weight ratio of just 1.75 kg per hp guarantees unrivaled performance levels; the Sesto Elemento goes from 0 to 100 km/h in just 2.5 seconds. These values are possible due to the use of a carbon fiber monocoque made of Forged Composite and extensive use of carbon fiber throughout the car, illustrating Lamborghini’s international leadership in composite materials technologies.